If you are a photographer or like taking pictures, you should prepare yourself a good camera bag. Do not think “why do I have to purchase a bag while I can keep it in my backpack or carry it on my neck”, it is not a good idea. Why? Let consider about the rain and how it affects your expensive camera or if you climb up the hill or mountain and you fall down, it does not only crash your camera, it also causes a worse damage to your body. That is the main reasons why we should buy a camera bad for our self. Let look at these top 10 best camera bags in 2018 and select one for yourself. 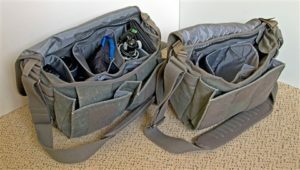 These camera bags are evaluated as the best products on the market by the millions of users from the local and online market. 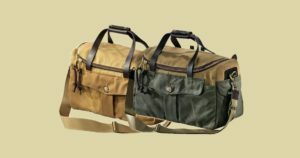 The first camera bag in this list is Peak Design Everyday Messenger Bag. This bag is designed by photographers and for photographers. It has many innovative features, such as MagLatch closure, weatherproof expandable protective shell or origami-inspired FlexFold divider. These advanced points have brought this bag to the best and premium camera list since it is produced. 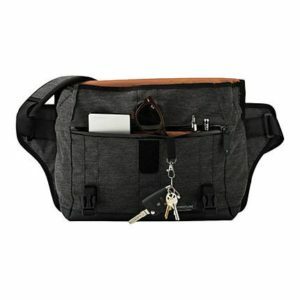 This versatile camera messenger bag has made the customers surprised with its large size – 15”. It does not contain 1 camera, 3 lenses, tripod, myriad, but you can also put your laptop and many accessories in it. That is the main reason why although this bag has a high price, it attracts lots of photographers come to it. 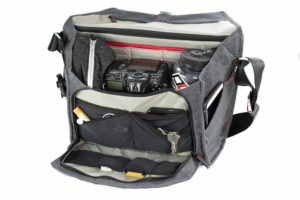 If you are finding a bag which can be used for both camera and travel, this is your great option. It can carry 2 DSLRs with 6 to 10 lenses and some others accessories. This is a perfect shoulder camera bags for both male and female photographers. Tough, 100% cotton canvas, waterproofed, breathable and compressible which make it become the perfect camera bag in the rain season. Another advanced thing of Domke F-2 is that it has 12 compartments and pockets which provides more spaces for your camera and any accessories. Do not worry, your shoulder never feel pain because the producer used the wide, adjustable and robust strap in order to help the users feel comfortable while using it. 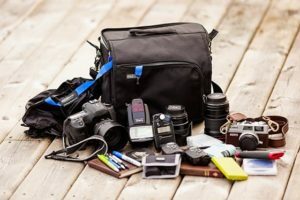 A good camera bag with a very suitable price – this is an ideal product for those who are finding the best camera bag with the suitable price. The retailer often creates a discount campaign for this product, so you can easily find it at a lower price. There are not many special points in this bag. However, it successfully attracts lots of customers not because of the discount, it is because this bag can be used in all kinds of weathers. Moreover, the bag’s front flap has a sewn hinge which protects fully your camera in all conditions. For example, it includes a removable and reversible cover to help you keep your stuff safe while it is rain or wet. If you do not like the above premium camera bag, Think Tank Photo Retrospective 30 –Sandstone is your next choice. This product is rated with 5/5 stars and becomes one of the top 10 best camera bags in 2018. The silencing tab, durable and rugged is what the photographers need for the wedding photography. It can contain up to 2 pro DSLR, 4 lenses, 2 flashes and many other accessories. In this year, a leather version has been released to offer the customers more choice for their camera bag. 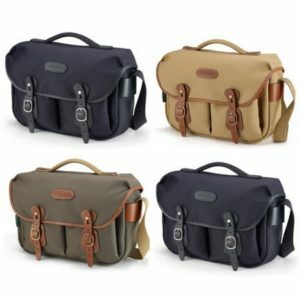 Billingham Haley Pro is a classic British shoulder camera bag with many different sizes. If you do not know which camera bag is the suitable one, you should choose this product. 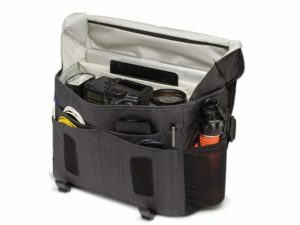 Lots of experienced photographers evaluate this is a good camera bag for both amateur and professional. With the 2 expansive pocket on the front, it can carry a DSLR with many lenses, flash and some small accessories. 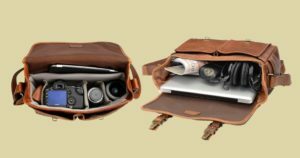 Similar with many best camera bags on the market, it has a beautifully crafted with clean, elegant lines and the brass details. Haley Pro is designed with a carry handle on top, so you can easily change it to handle bag within a second. Moreover, its main flap is sculpted around the sides which make this product becomes an ideal one in the rain or snow season. This is a leather camera bag for both men and women. ONA – The Brixton is designed to protect your camera in all conditions. It can carry up to one DSLR, 3 lenses and 10 – 13” laptop. Do not think this is a small camera bag! In fact, it has four removable dividers and it is very easy to customize depending on your needs. There is not much special information about this product from the producer except it is made from the high-quality leather and can protect fully your camera. However, as a photographer, what do we need more than that, right! This is size wise camera bag which can accommodate one DSLR, 4 lenses, 2 flash and some other items. It is designed with a zippered top flap, a front buttoned pouch and dual side snap-flap pouches which provide more spaces for the users. Especially, it is made from 100% cotton tin cloth, so it can survive in all conditions. If you love to travel and photography, this is your best option.An exclusive camera bag for the professional photographers. 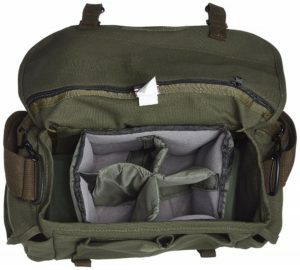 Comparing with lots of premium products, the market price of Filson 70143 Original Sportsman Camera Bag is more expensive, but it is really worth. A nice shoulder camera bag for amateur photographers or someone who likes taking the photo while travelling. It is designed with a full-grain leather and can contain a standard DSLR, 2-4 zoom lenses and one 10” laptop or tablet. With the flip-top lid, the users can easily access to gear. Unlike the above camera, ThinkTank SubUrban Disguise 30 has a lower market price. 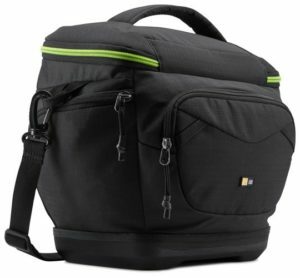 If you are looking for a high-quality camera bag under $100, this product is what you look for. Although Kontrast DSLR Zoom Holster is evaluated as a small camera bag, it can carry a DSLR and a big lens (up to 105mm). Besides that, it has many useful features like the premium camera on the market, such as waterproof, protect your camera in all condition and easy to access your stuff. We can say that this is the perfect product for a travel day.This camera bag is under $50. The main reason that brings this camera to the list top 10 best camera bag in 2018 is it has a small design and has a decent curved-backpack.